The Extended Upper Shelf Radius Front offers the same innovative merchandising option for electrical or electronic items as the Standard Upper Shelf with Radius Front does for the non-electrical merchandise. The DGA2 tag accepts 1 1/4” price tags. The extended bracket provides a 2” space for electrical cords to be passed behind the shelf. The shelf includes DGA2 tag molding to match the shelf. It can also be ordered as gold, silver anodized, or painted in a contrasting color. 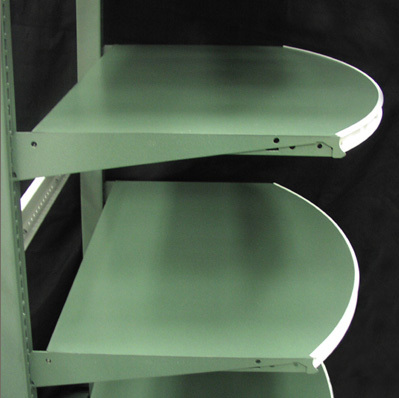 Radius shelves and shelving might work well in situations like drawing more attention to slow moving products that need to be tested to see if they should be included in your existing product line.